yesterday my new mini-album how they are was released in europe by my good friends bella union, and the north american release will follow soon (september 14) on hush. this autumn i’ll be on tour in europe to support the new release. keep an eye on the shows page for updated tour dates. 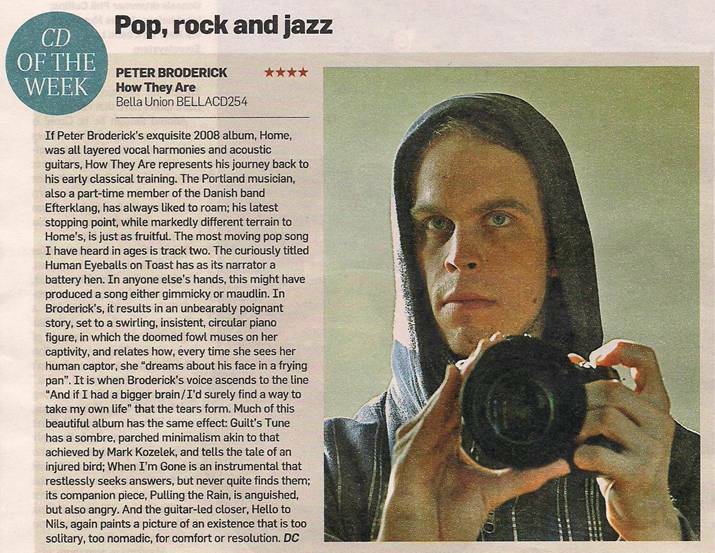 i was very pleasantly surprised to find out that the sunday times has chosen how they are as album of the week! a big thanks to them for the support. come october i hope to see some of you out on the road! in the meantime i’ll be on tour in north america with efterklang for the rest of september. Three tracks up for listening on my myspace page. This entry was posted on Tuesday, September 7th, 2010 at 12:26 pm	and is filed under News. You can follow any responses to this entry through the RSS 2.0 feed. You can leave a response, or trackback from your own site.